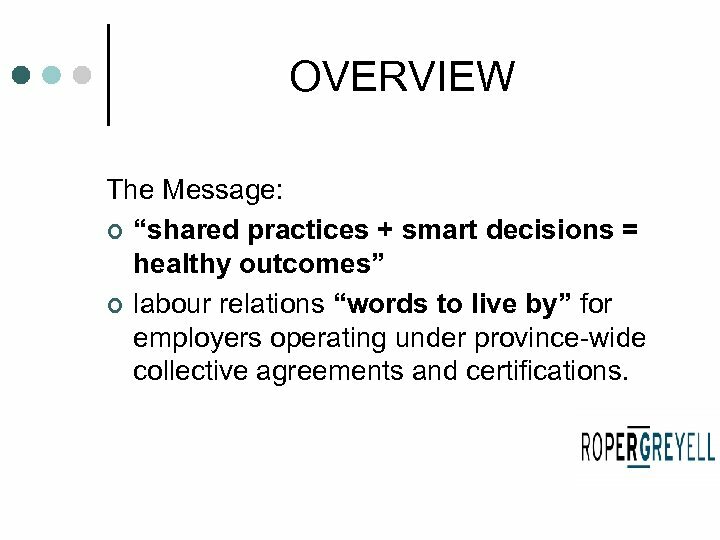 OVERVIEW The Message: ¢ “shared practices + smart decisions = healthy outcomes” ¢ labour relations “words to live by” for employers operating under province-wide collective agreements and certifications. 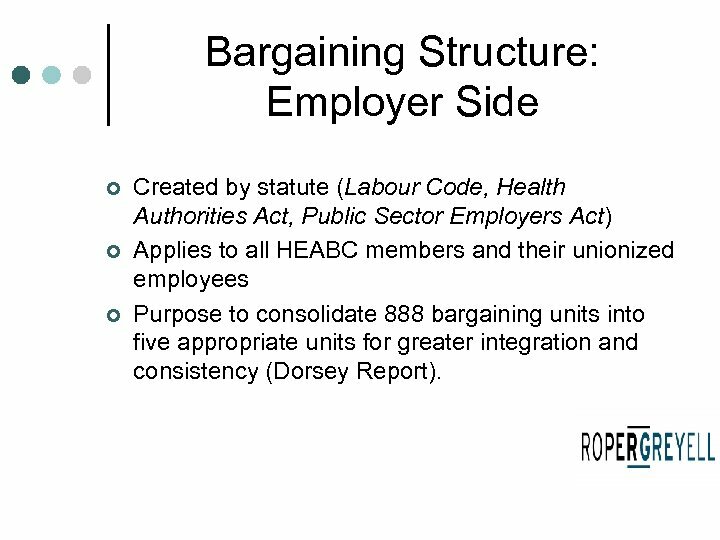 Bargaining Structure: Employer Side ¢ ¢ ¢ Created by statute (Labour Code, Health Authorities Act, Public Sector Employers Act) Applies to all HEABC members and their unionized employees Purpose to consolidate 888 bargaining units into five appropriate units for greater integration and consistency (Dorsey Report). 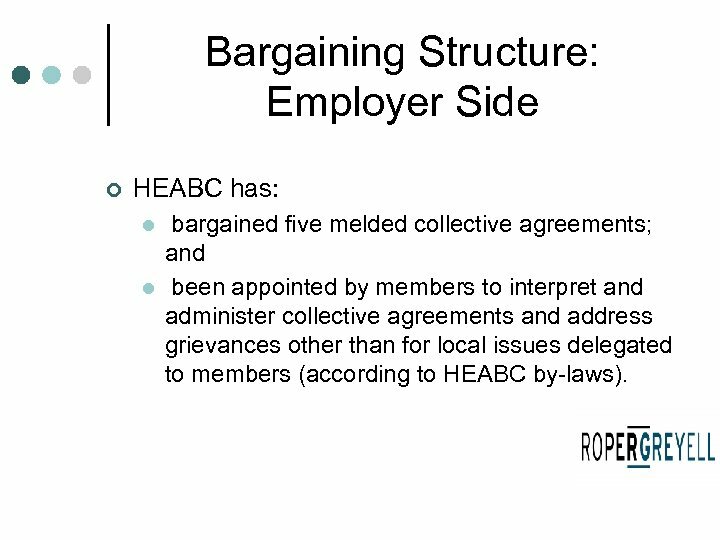 Bargaining Structure: Employer Side ¢ HEABC has: l l bargained five melded collective agreements; and been appointed by members to interpret and administer collective agreements and address grievances other than for local issues delegated to members (according to HEABC by-laws). 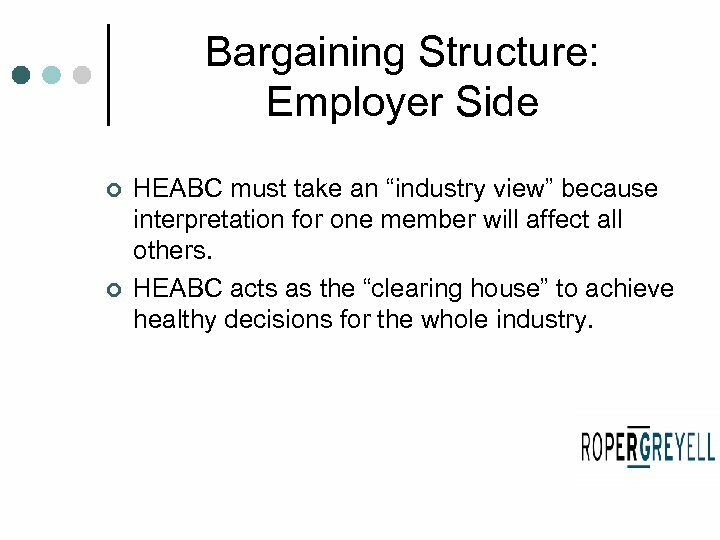 Bargaining Structure: Employer Side ¢ ¢ HEABC must take an “industry view” because interpretation for one member will affect all others. HEABC acts as the “clearing house” to achieve healthy decisions for the whole industry. 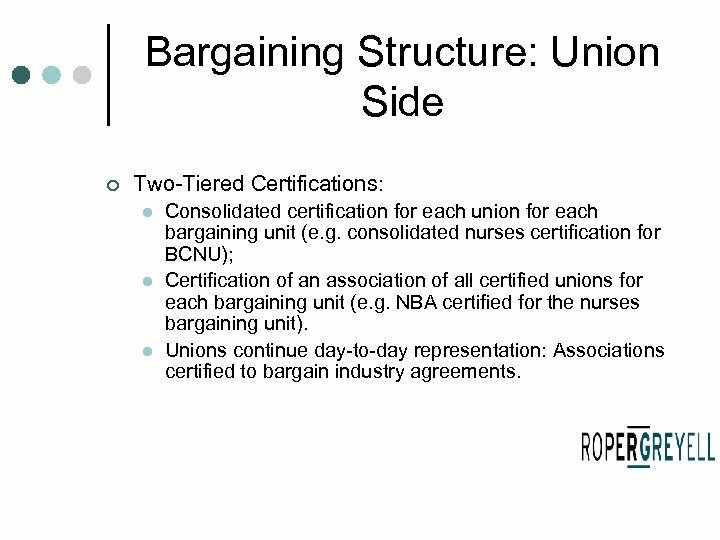 Bargaining Structure: Union Side ¢ Two-Tiered Certifications: l l l Consolidated certification for each union for each bargaining unit (e. g. consolidated nurses certification for BCNU); Certification of an association of all certified unions for each bargaining unit (e. g. NBA certified for the nurses bargaining unit). Unions continue day-to-day representation: Associations certified to bargain industry agreements. 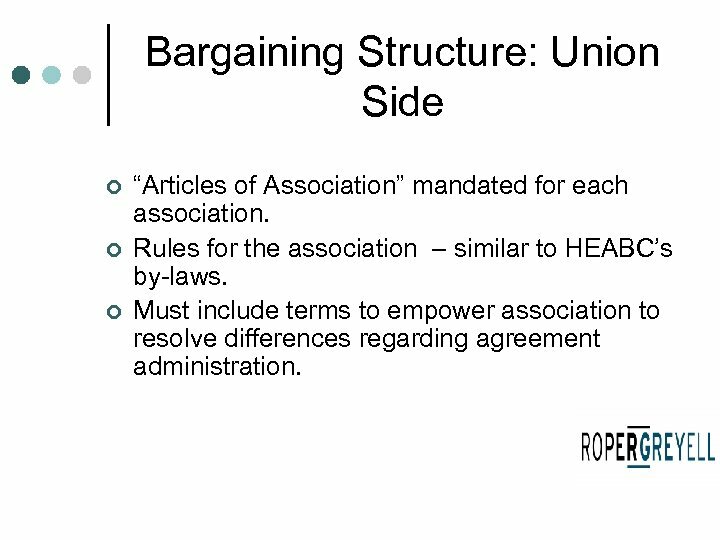 Bargaining Structure: Union Side ¢ ¢ ¢ “Articles of Association” mandated for each association. Rules for the association – similar to HEABC’s by-laws. 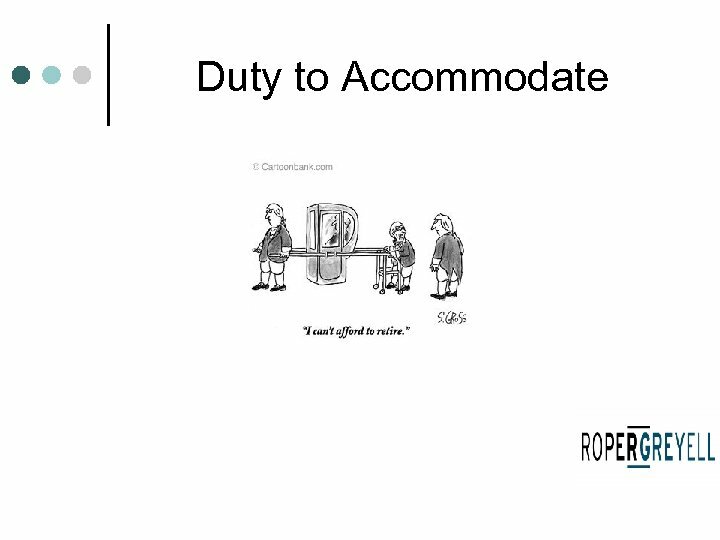 Must include terms to empower association to resolve differences regarding agreement administration. Bargaining Structure: Union Side ¢ Articles say that: l l l Unions must notify Association of grievances that might affect other unions. Association has sole discretion to decide how to proceed: the “clearing house” on union side. 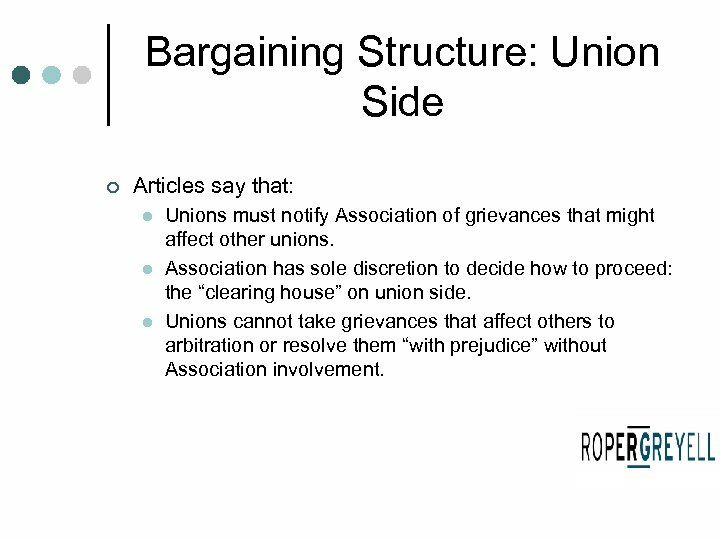 Unions cannot take grievances that affect others to arbitration or resolve them “with prejudice” without Association involvement. The Challenge for Employers ¢ ¢ HEABC’s mandatory “clearing house” role applies after a grievance is filed, not when the employer makes an operations decision that might provoke a grievance. 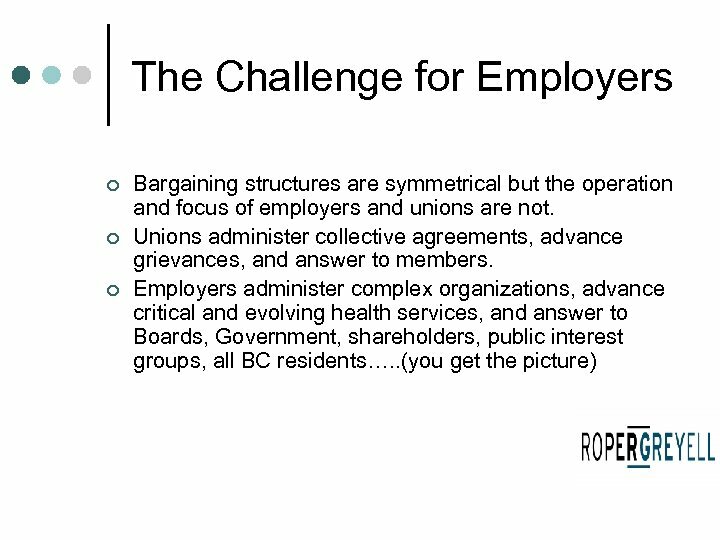 Disparate practices may be revealed to employers only when the union uses them to advantage at arbitration. Likely well known to Union when grievance filed! The Solution for Employers ¢ “Knowledge is Power” l l ¢ Know what other employers are doing in similar circumstances and how circumstances may differ; Identify grievance risks when decisions are made. A “systems” approach l l Sensitivity to industry context; Embrace “shared practices” as part of “smart decisions”. 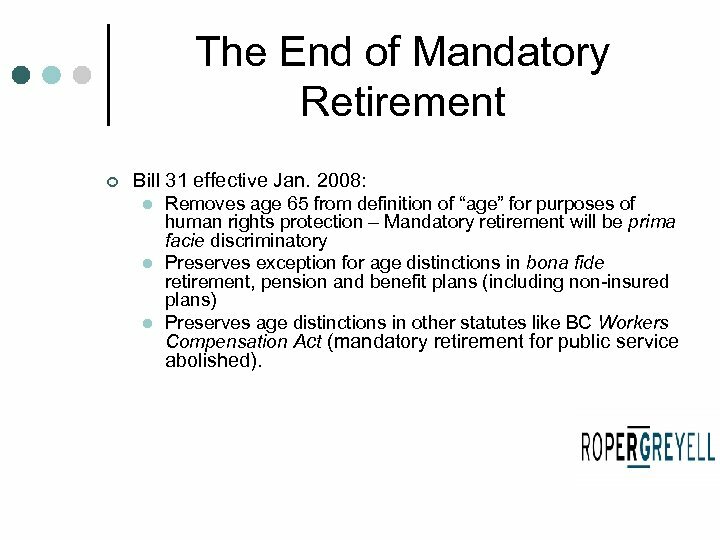 The End of Mandatory Retirement ¢ Bill 31 effective Jan. 2008: l l l Removes age 65 from definition of “age” for purposes of human rights protection – Mandatory retirement will be prima facie discriminatory Preserves exception for age distinctions in bona fide retirement, pension and benefit plans (including non-insured plans) Preserves age distinctions in other statutes like BC Workers Compensation Act (mandatory retirement for public service abolished). 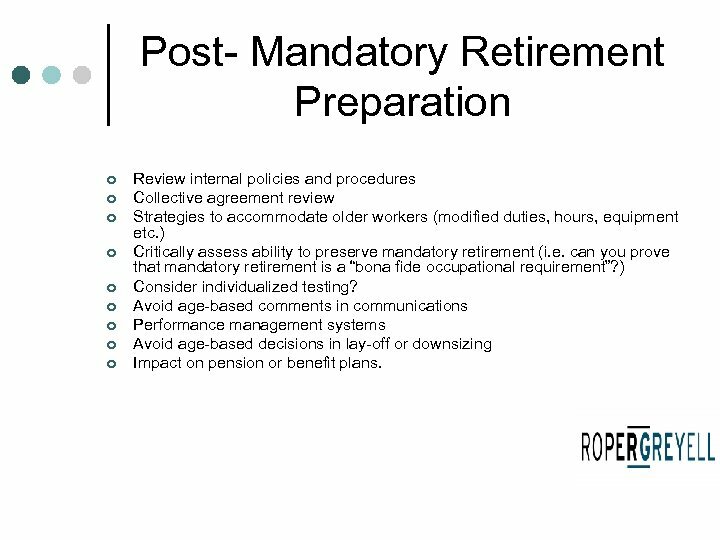 Post- Mandatory Retirement Preparation ¢ ¢ ¢ ¢ ¢ Review internal policies and procedures Collective agreement review Strategies to accommodate older workers (modified duties, hours, equipment etc. ) Critically assess ability to preserve mandatory retirement (i. e. can you prove that mandatory retirement is a “bona fide occupational requirement”? ) Consider individualized testing? 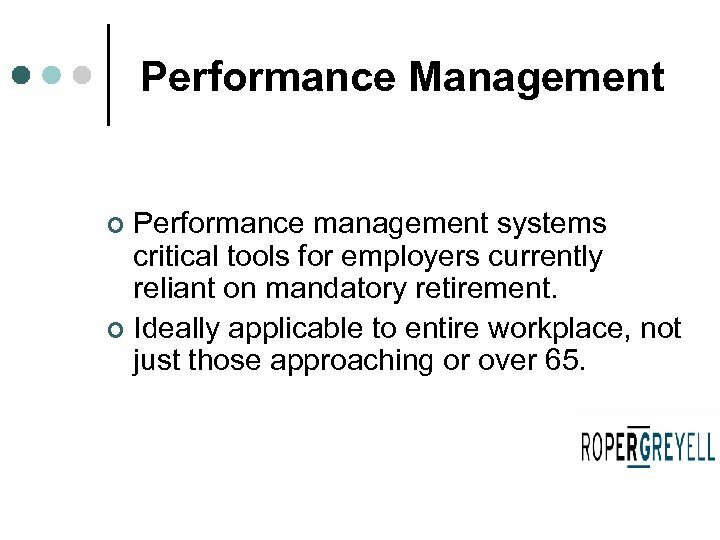 Avoid age-based comments in communications Performance management systems Avoid age-based decisions in lay-off or downsizing Impact on pension or benefit plans. 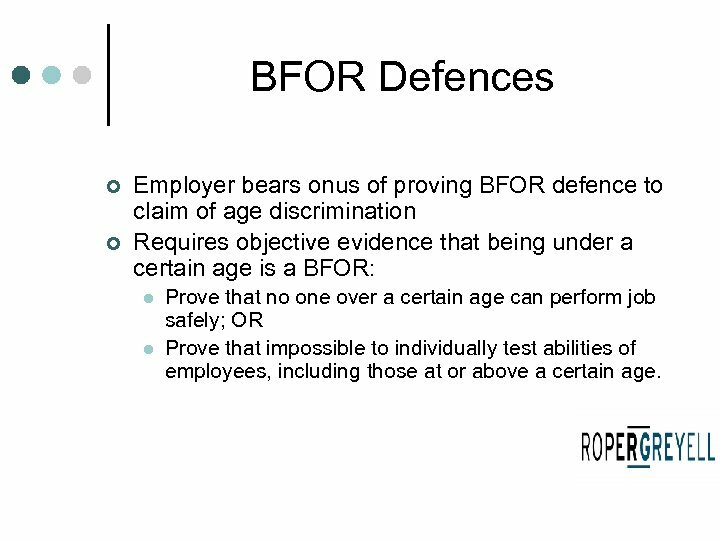 BFOR Defences ¢ ¢ Employer bears onus of proving BFOR defence to claim of age discrimination Requires objective evidence that being under a certain age is a BFOR: l l Prove that no one over a certain age can perform job safely; OR Prove that impossible to individually test abilities of employees, including those at or above a certain age. 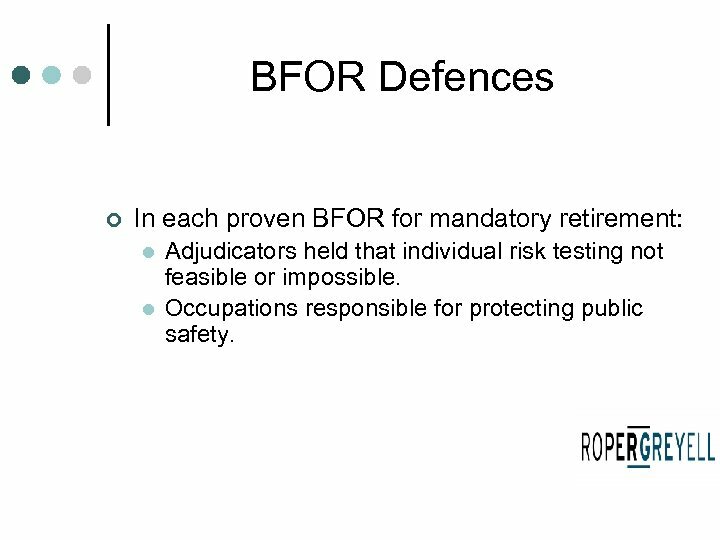 BFOR Defences ¢ In each proven BFOR for mandatory retirement: l l Adjudicators held that individual risk testing not feasible or impossible. Occupations responsible for protecting public safety. 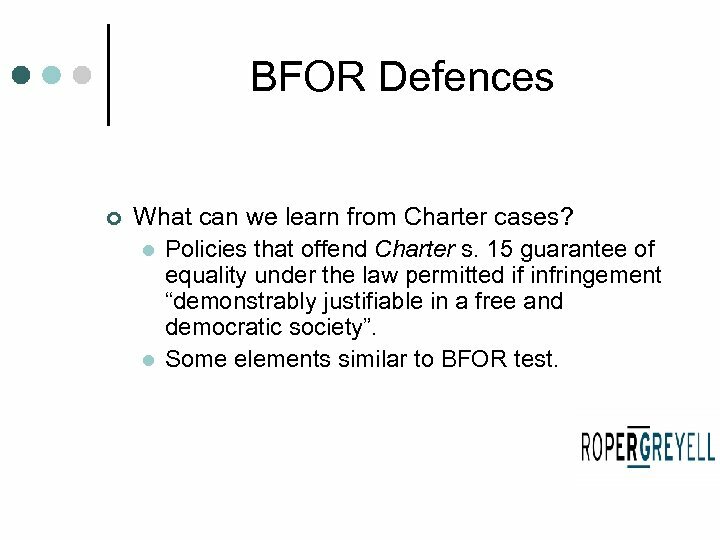 BFOR Defences ¢ What can we learn from Charter cases? l Policies that offend Charter s. 15 guarantee of equality under the law permitted if infringement “demonstrably justifiable in a free and democratic society”. l Some elements similar to BFOR test. 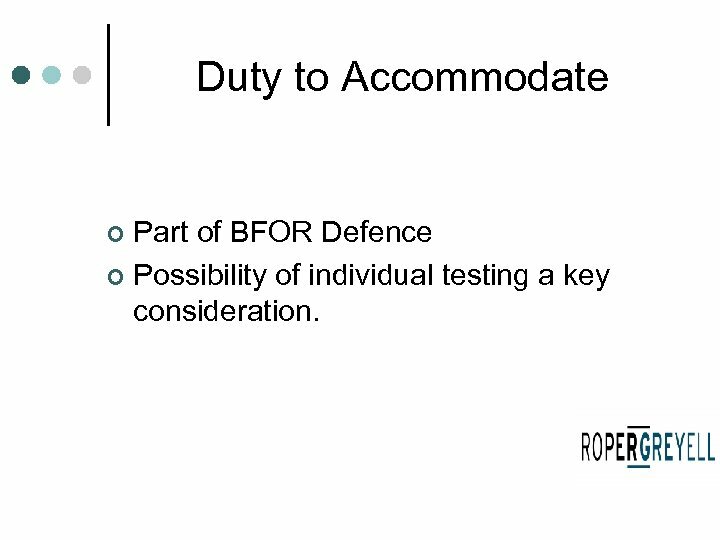 BFOR Defence ¢ BC Govt. 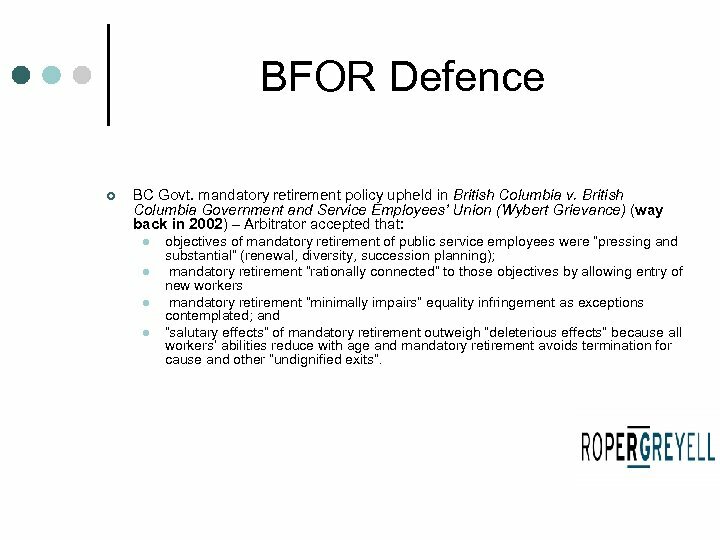 mandatory retirement policy upheld in British Columbia v. British Columbia Government and Service Employees’ Union (Wybert Grievance) (way back in 2002) – Arbitrator accepted that: l l objectives of mandatory retirement of public service employees were “pressing and substantial” (renewal, diversity, succession planning); mandatory retirement “rationally connected” to those objectives by allowing entry of new workers mandatory retirement “minimally impairs” equality infringement as exceptions contemplated; and “salutary effects” of mandatory retirement outweigh “deleterious effects” because all workers’ abilities reduce with age and mandatory retirement avoids termination for cause and other “undignified exits”. 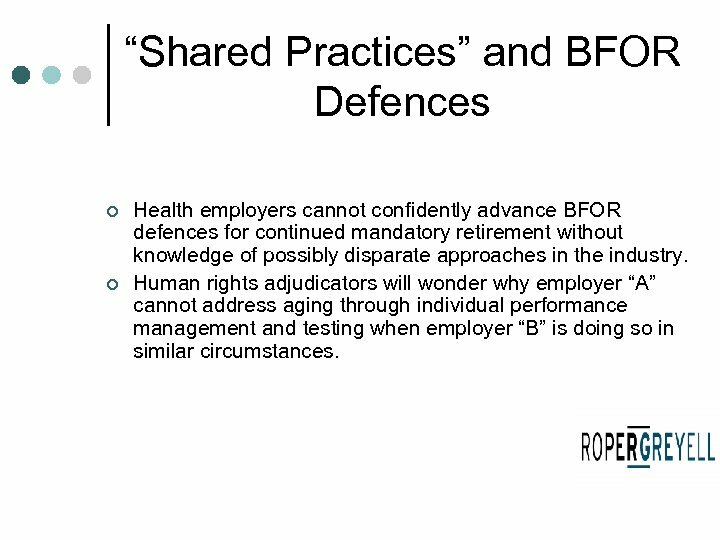 “Shared Practices” and BFOR Defences ¢ ¢ Health employers cannot confidently advance BFOR defences for continued mandatory retirement without knowledge of possibly disparate approaches in the industry. Human rights adjudicators will wonder why employer “A” cannot address aging through individual performance management and testing when employer “B” is doing so in similar circumstances. 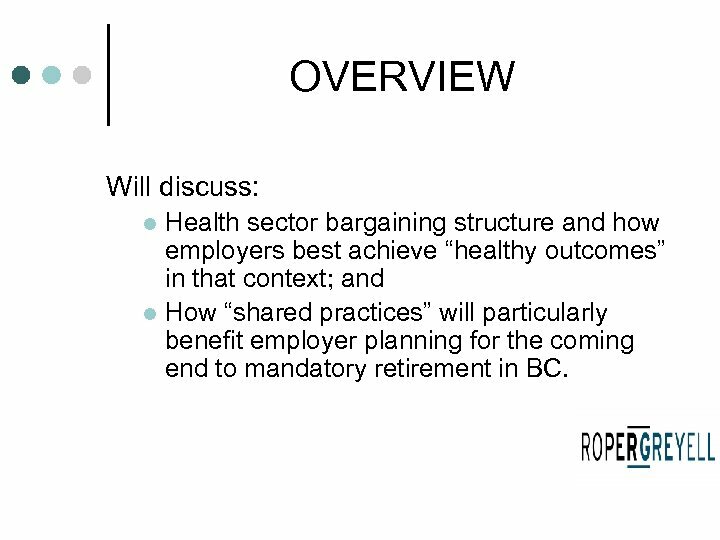 “Shared Practices” and Duty to Accommodate ¢ ¢ Health employers cannot confidently prove accommodation of older workers not possible without knowledge of possibly disparate approaches in the industry. 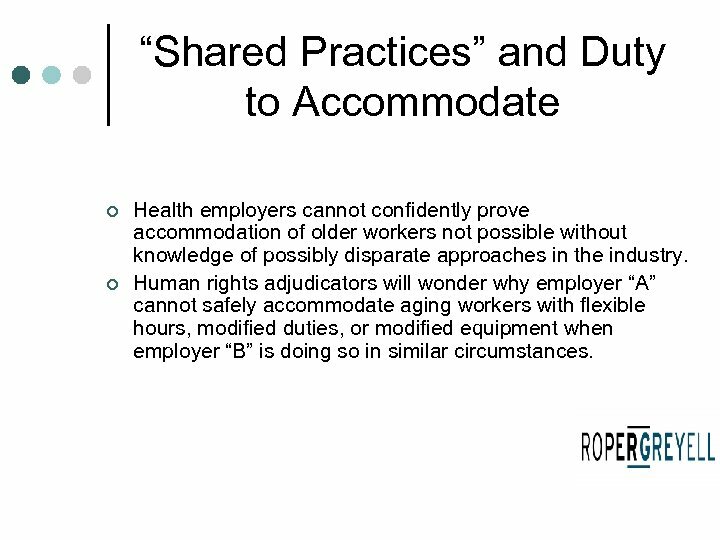 Human rights adjudicators will wonder why employer “A” cannot safely accommodate aging workers with flexible hours, modified duties, or modified equipment when employer “B” is doing so in similar circumstances. 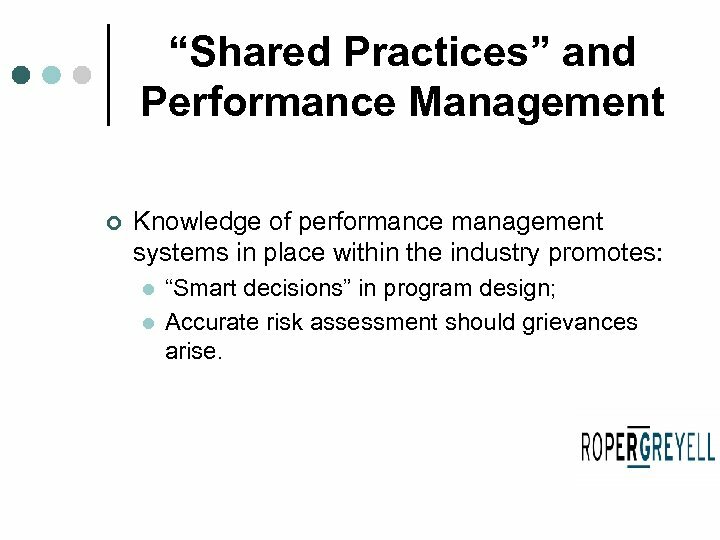 “Shared Practices” and Performance Management ¢ Knowledge of performance management systems in place within the industry promotes: l l “Smart decisions” in program design; Accurate risk assessment should grievances arise. 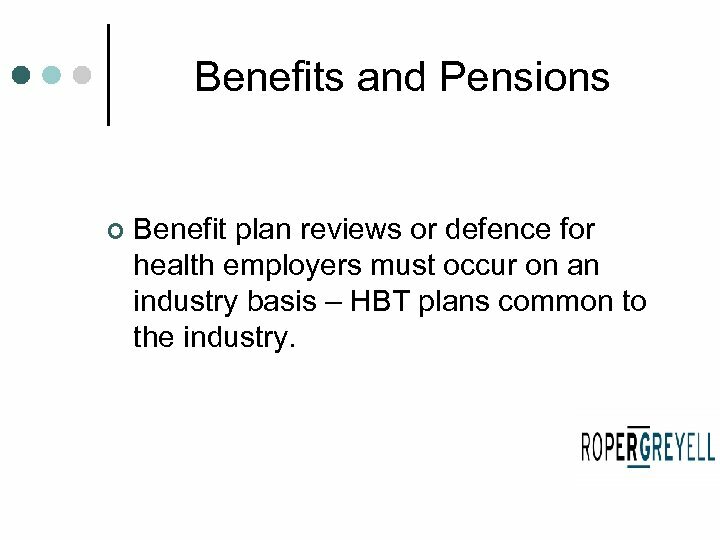 Benefits and Pensions ¢ Benefit plan reviews or defence for health employers must occur on an industry basis – HBT plans common to the industry. 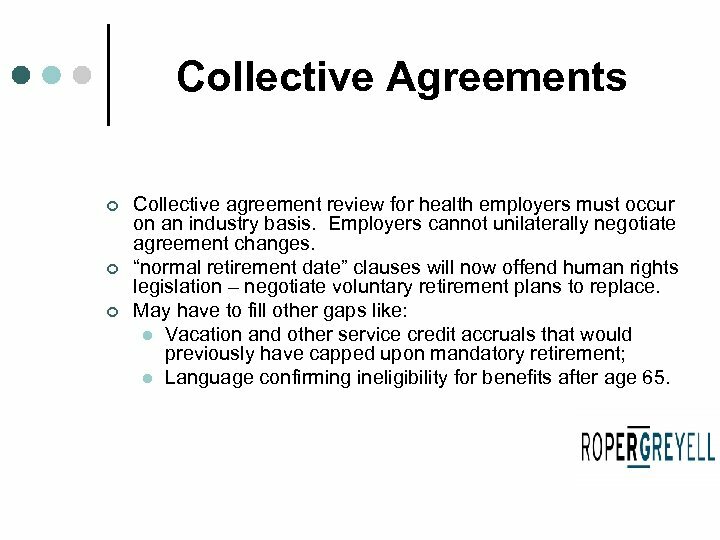 Collective Agreements ¢ ¢ ¢ Collective agreement review for health employers must occur on an industry basis. Employers cannot unilaterally negotiate agreement changes. 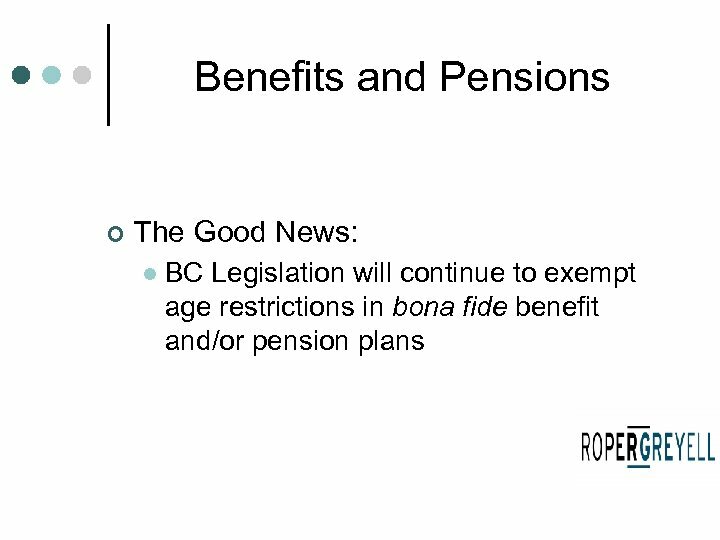 “normal retirement date” clauses will now offend human rights legislation – negotiate voluntary retirement plans to replace. 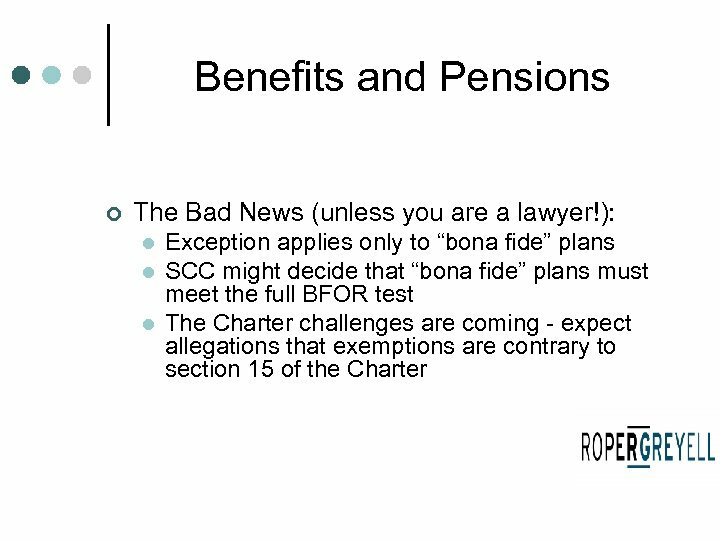 May have to fill other gaps like: l Vacation and other service credit accruals that would previously have capped upon mandatory retirement; l Language confirming ineligibility for benefits after age 65. 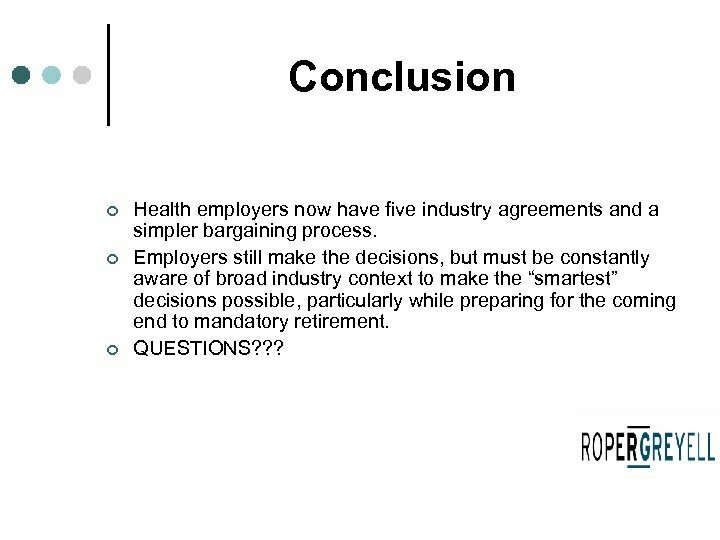 Conclusion ¢ ¢ ¢ Health employers now have five industry agreements and a simpler bargaining process. Employers still make the decisions, but must be constantly aware of broad industry context to make the “smartest” decisions possible, particularly while preparing for the coming end to mandatory retirement. QUESTIONS? ? ?